A classic solo piano album from Thelonious Monk – recorded live in San Francisco, and maybe one of his best albums ever in the format! There's a special sort of quality that makes Monk's solo work so different from his trio, quartet, and larger group music – this real understanding of the piano, and a personal sense of sonic shading, even when covering some of his familiar compositions – maybe a bit like the way that Sun Ra's solo piano is also so distinct. 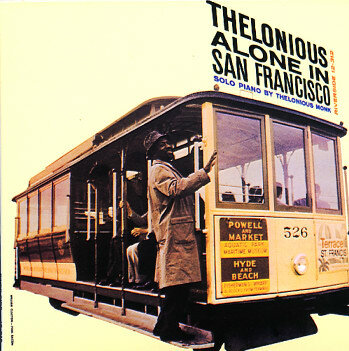 Most of the tunes here are Monk originals or standards that Thelonious has played before at least a few times on record – but the solo setting almost has him pulling the tunes apart slowly – contemplating their components, then stepping through them with new inspiration as he puts them back together. Titles include "Blue Monk", "Pannonica", "Remember", "Reflections", "Bluehawk", "Everything Happens To Me", and "Round Lights". © 1996-2019, Dusty Groove, Inc.